It’s hard to believe that school is already in session, right? With 6 kids, you can just imagine how crazy busy it got shopping for shoes, clothes and supplies! I’m so glad that there are sites like Zappos that make shopping for the back-to-school season easy and fun! I especially love Zappos because they make it easy to find sizes for all of our kids (even wide-shoe sizes)! Zappos is an advocate for parents, offering a vast selection of “hard-to-find” sizes to provide each child the perfect fit. Hard-to-find shoe widths are no problem. Zappos strives to stock its online shelves with widths that might not be found at a brick and mortar. After all, finding the best shoe fit insures each child will experience the ultimate in comfort and reliability. Another great thing about Zappos is that it supports students’ ‘Bright Futures.’ Bright Futures is relevant to both fashion trends (kids want a pop of bright colors in their wardrobe & sneakers) and it also speaks to education providing a bright future. Zappos not only offers great deals on products, but recognizes the value of our time. Time is money, and with Zappos, there’s no rushing to the store to find “required apparel” for the back-to-school. Because of uniform requirements, white sneakers or oxfords can sell out at physical stores. Even though winter may be months away, some schools require that snow shoes are brought to school on Day 1 to make sure they are there when the child needs them in winter. Many of the back-to-school most popular items – like polos and khakis (for uniforms), Mary Janes, athletic sneakers or snowboots – are available and in stock. Zappos has the most trusted brands to meet all the growing needs of kids. Convenience and an ample inventory make it easy for moms to shop. 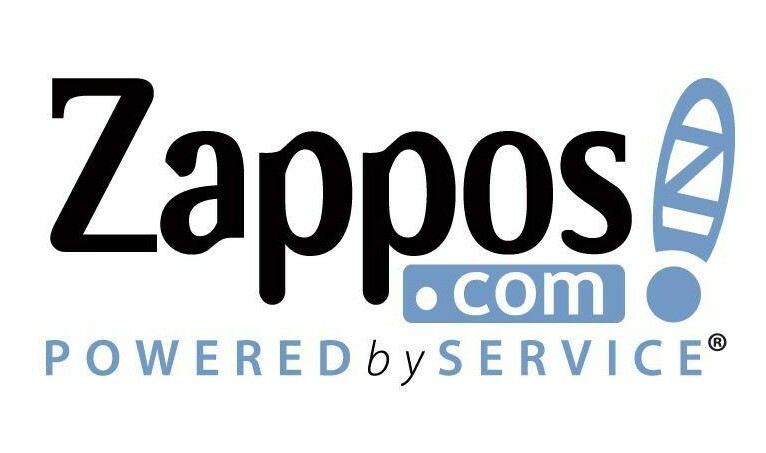 Zappos.com accepts orders 24 hours a day, 7 days a week. Zappos.com begins selling back-to-school apparel and shoes in July, long before similar items appear on shelves in many physical stores. Each back-to-school purchase on Zappos.com is backed by the company’s renowned and unparalleled customer service, including fast and free shipping, and easy 365-day returns. Zappos understands that back-to-school can be a stressful time for parents to shop and they want to make it as easy as possible. Zappos knows comfort and fashion. 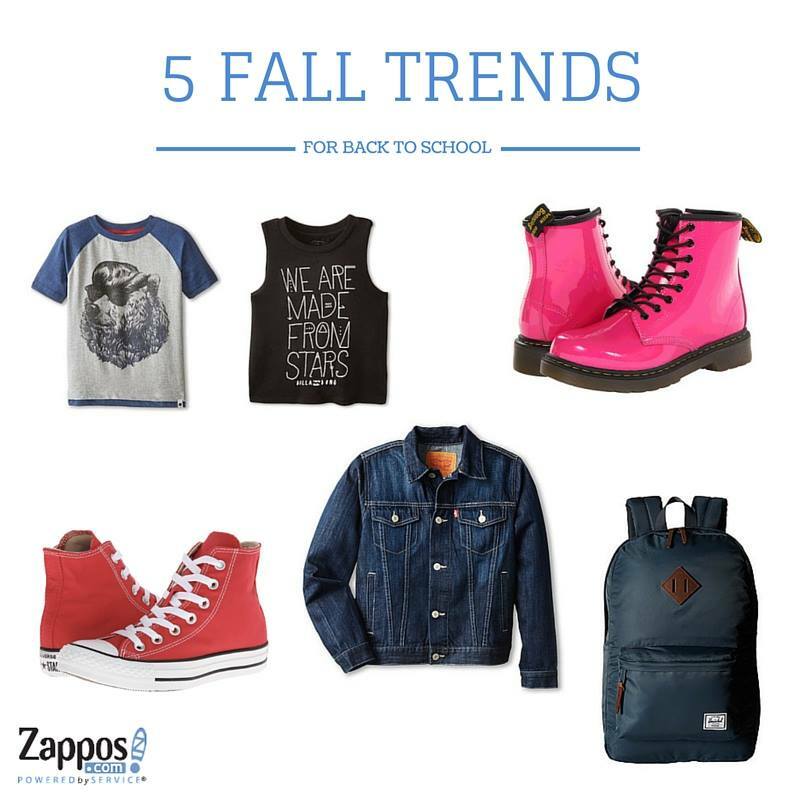 Zappos’ stylists stay ahead of the trends and provide parents with the must-haves for the school season. Heritage/Retro – Everything that is old is new again. 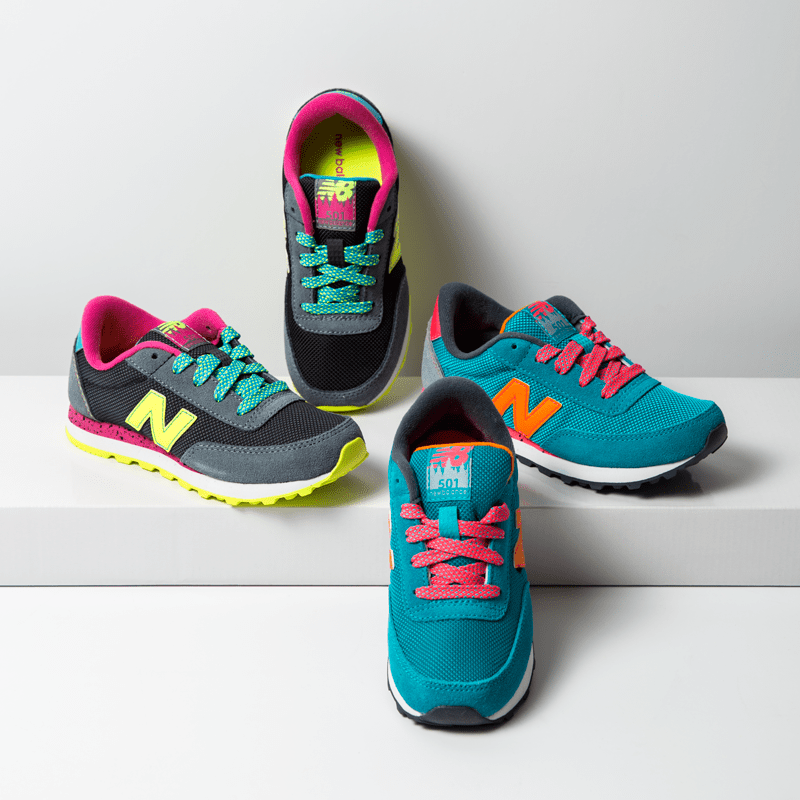 Zappos has all the cool retro looks from New Balances to Doc Martens. Mini-Me – Zappos has all the “Mini-me” versions of the most covetable lines. DIYs – Zappos is encouraging kids to celebrate their individuality through the DIY trends. For kids, it’s all about expressing their creativity through their funky shoelaces, colorful backpacks for tie dyed . With the school season in effect and 6 kids to take to 3 different schools, we have a few handy tips to make the morning routine go smoothly. Pick up coffee – yay – and head home to work = a successful morning!! What are your favorite back-to-school items to purchase at Zappos? Wow!! I just love those shoes, I’m gonna have to check out Zappos!! I don’t know why I haven’t tried Zappos yet! It looks like the perfect solution for back to school shopping for shoes. My sister recently introduced me to Zappos and I am hooked! I have found so many adorable items for my daughter! 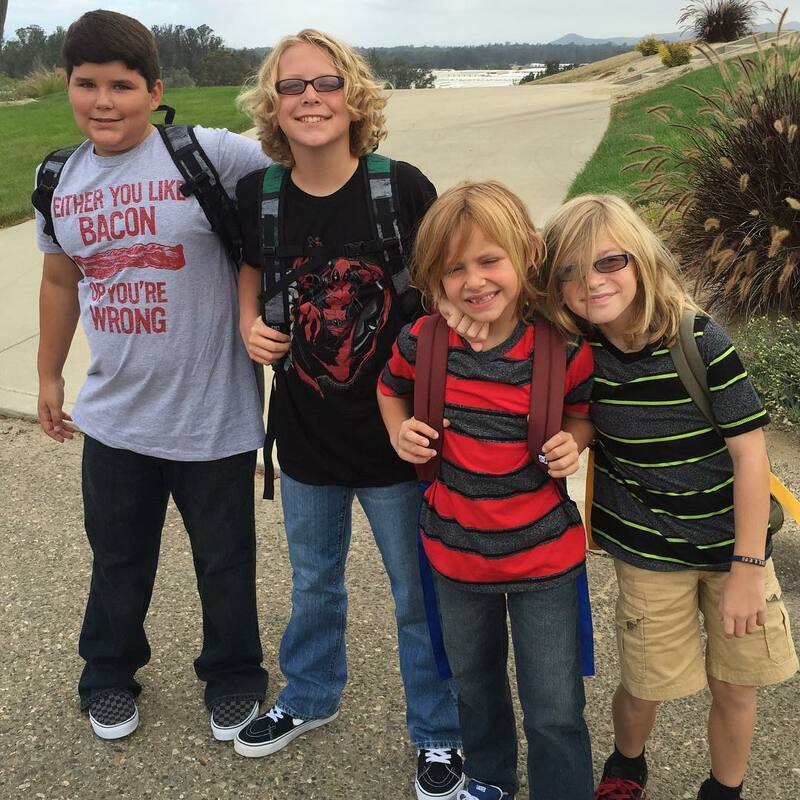 Love that bacon shirt in the picture!!! Sounds like you are organized for sending six kids off to school! Zappos is such a great place to get shoes and the ones pictured are super cute. I’ll have to try and find the “we are made from stars” t-shirt, perfect for my girl. We love Zappos. It’s so convenient buying what you need from the comfort of home. And their shipping/return policy is great! I love those pink boots! I love browsing Zappos and picking out all my favorite things. Your kids are adorable! If there is one thing that definitely needs to be made easier it is back to school shopping. The kids look great, and add to that convenience and savings and it is a total win! I’ve used Zappos in the past – They have really great deals, and products! I never thought about how easy it would make school shopping. Great idea! I used to love back to school shopping when I was a kid! I wish I knew about Zappos when I was doing my shopping. Great post! Zappos has a very large selection of items that can go with just about anyone’s style. I really like their selection of shoes. I had one child to take school shopping and get ready for school. Kudos to you for your organizational skills and thank goodness for Zappos! My grandchildren would love these I’m sure. Going to have to let my daughters know about these. They look like one of those one shop stop! That’s for me. I love the shoes for my son all colors are pretty. Awesome shoes indeed! Gotta check zappos too! i love those new balance! i’ve never shopped there before! I love Zappos. I love taking my kids clothing shopping and school supply shopping for back to school.